Eric Devries‘ third solo CD ‘Close to Home’ was released in june 2014 and got great reviews in the music press. Critics mentioned his songwriting skills were up to par to the likes of Guy Clark or Rodney Crowell. Some described the CD to be one of the best ‘Americana’ records that was ever released in the Netherlands by a dutch songwriter. And by listening everyone agrees that ‘Close to Home’ is an outstanding album by all international standards. His name got established first in ’92 when he came in second in the biggest talent hunting competition ‘De Grote Prijs van Nederland’ with his band ‘The Big Easy’. They toured the Netherlands and Switzerland but unable land a record deal in those days the band quit in ’97. It wasn;t untill 2004 that Devries finally released his debut CD ‘Little of a Romeo’ that got him straight to the top of the Dutch Americana songwriting scene. (“.. natural successor to Rodney Crowell..” “..whole album full of little gems..”) Eric Devries formed a collective with three colleques under the name of ‘Songwriters United’ and released a ‘live’ DVD and a CD called ‘Another Round with.. Songwriters United’. His second solo album ‘Sweet Oblivion’ appeared in 2007 and featured three songs that Devries recorded while on tour in Oklahoma, USA. Two more extended tours in Oklahoma followed. Devries also started hosting a series of concerts with singer-songwriters in the cities of Nijmegen, Utrecht and in his beloved Amsterdam. All the while continuing to perform live himself – week in week out – at venues and festivals where he entertains and touches audiences with his stories, his voice, and his wicked finger-picking guitar style. It’s been seven years since ‘Sweet Oblivion’ was released, but in June 2014 Eric Devries’ third album ‘Close to Home’ will be hitting the shelves. Was the delay a case of ‘seven years’ bad luck’, or an example of ‘life is what happens while you’re busy making other plans’? Neither and both. As the title, ‘Close to Home’, suggests, this album is his most biographical so far. Love and goodbyes, life and death, regrets and starting over – set against a background of different places and spaces. Devries sings about his hometown Amsterdam in one song, and takes the listener on a road trip through places like Tulsa, Birmingham – and even Jerusalem – in another. The themes that Devries uses to paint a picture in song – at times up close and personal, and others tongue in cheek – are a wry and rocking celebration of life with all its ups and downs. The 70’s singer-songwriter storytelling tradition but with a modern twist. Close to Home was produced by fellow artist and producer BJ Baartmans, with whom Eric also coordinated in recent years a CD and DVD showcasing the talents of the Dutch ‘Songwriter United’ collective. Instrumental back up on ‘Close to Home’ was provided by the best artists that Devries and Baartmans – in their years of joint touring – have come across and often performed with. adding a great element of musical intuition, familiarity and spontaneity. Eric Devries wrote his first song in 1976, just before Punk Rock hit the Netherlands, and started his stage career soon after. And he’s been writing and performing ever since. In 1992, together with his band the Big Easy, Eric took second place in the national “Grote Prijs van Nederland” music contest. His debut solo CD, ‘Little of a Romeo’, was released in 2004 to rave reviews. In the following years, Eric crossed the big pond three times to tour in the United States and recorded a number of songs for his second solo album, ‘Sweet Oblivion’, in a studio in Tulsa, Oklahoma. It’s been seven years since ‘Sweet Oblivion’ was released, but in May 2014 Eric Devries’ third album ‘Close to Home’ will be hitting the shelves. Was the delay a case of ‘seven years’ bad luck’, or an example of ‘life is what happens while you’re busy making other plans’? Neither and both. As the title, ‘Close to Home’, suggests, this album is his most biographical so far. Love and goodbyes, life and death, regrets and starting over – set against a background of different places and spaces. Devries sings about his hometown Amsterdam in one song, and takes the listener on a road trip through places like Tulsa, Birmingham – and even Jerusalem – in another. The themes that Devries uses to paint a picture in song – at times up close and personal, and others tongue in cheek – are a wry and rocking celebration of life with all its ups and downs. The 70’s singer-songwriter storytelling tradition but with a modern twist. 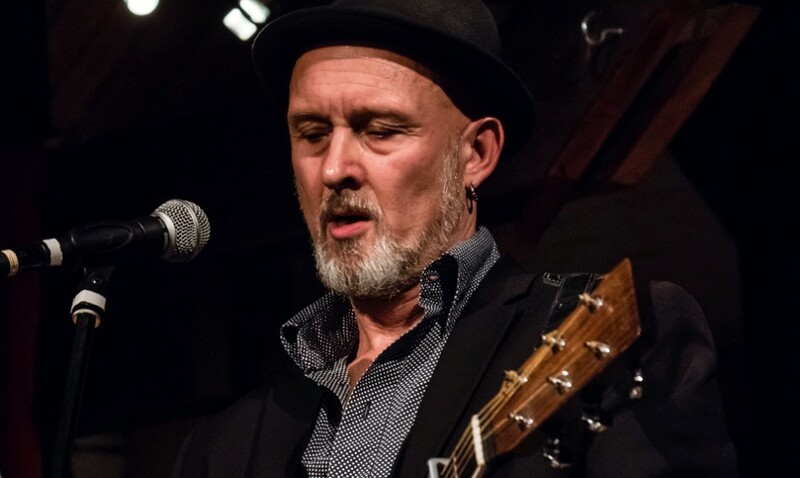 At the same time, Devries has also become a leading booker bringing international singer-songwriters from all over the world to the Netherlands, with regular concerts that he organizes in Utrecht, Nijmegen and the Netherlands. All the while continuing to perform live himself – week in week out – at venues and festivals where he entertains and touches audiences with his stories, his voice, and his wicked finger-picking guitar style. Close to Home was produced by fellow artist and producer BJ Baartmans, with whom Eric also coordinated in recent years a CD and DVD showcasing the talents of the Dutch ‘Songwriter United’ collective. Instrumental back up on ‘Close to Home’ was provided by the best artists that Devries and Baartmans – in their years of joint touring – have come across and often performed with. adding a great element of musical intuition, familiarity and spontaneity. At the end of 2003 Devries, together with longtime friend and sidekick Stephan van der Meijden as drummer and producer, finally decided to show his hand. With contributions by a.o. BJ Baartmans on slide guitar, Eric van de Bovenkamp on piano, Arend Bouwmeester on clarinet, Emma Breedveld on violin, debut cd ‘Little of a Romeo’also features a stunning duet between Devries and Powderblue lead-singer Marjolein van der Klauw. With this album Devries confirmed his once appraised status as a songwriter. The release of ‘Little of a Romeo’ was followed by airplay on both national and local radiostations. As well as a tour of America’s sooner state Oklahoma and a TV appearance on Devries’ hometown TV station AT5. Devries also contributed to the tribute live cd in honor of Ad van Meurs a.k.a. The Watchman, recorded at The Gazstation in Helden-Panningen. Teaming up with contemporary collegues resulted in the birth of ‘Songwriters United’. This singing-songwriting collective released a live concert DVD in june 2005 and a cd (‘Another Round with…’) in 2008. Also at the end of 2008 Devries releases his second solo album ‘Sweet Oblivion’ (Inbetweens Records). Again with Stephan van der Meijden producing and most of the songs backed up by ‘The Easy’ with guitarist Alan McLachlan, bassist Bartel Bartels and pedal steel player Harrie Brekelmans. Other contributions by Eric van de Bovenkamp and singer Jelka van Houten. ‘Sweet Oblivion’ also features the Tulsa Tapes, three songs Devries recorded while on tour in Oklahoma, USA. Succession of Rodney Crowell taken care of. The furtile soil for americana in the Netherlands has been transormed into a true constellation of stars these last years. JW Roy, BJ Baartmans, Powderblue, Yearlings, Smalltown Romeos have become household names by now. In this constellation a new star has revealed itself, the guitarist from BJ’s Pawnshop, Eric Devries. Together with Stephan van der Meijden (Pawnshop also), as both drummer and producer, Devries with these fifteen songs has made an excellent map of the music of the southern States of America. His direct and accesible songs are host to influences from traditional music such as country, blues, (roots)rock and even New Orleans mardi gras. In that sense But For The Grace Of God with it’s stringarrangement is the odd one out. Eric has a fine voice capable of singing the moving ballads as well as the more rocking pieces. Only the passionate outcries in These Wasted Days seem a bit off. Still he stakes his claim to the honorary titel of the natural successor to Rodney Crowell. The more intimate ballads (Lost In Between) as well as the more up-tempo songs (Some Unlucky Star, Me And My Love) would not be misplaced on the recent Crowell-cd’s. In one of the prizesongs Remains Of The Day supported by a very nice backingchoir Roy Orbison comes around. The songs are very tastefully performed with fine appearances by BJ Baartmans, Bartel Bartels and Arend Bouwmeester. The beatiful vocal attributions of Powderblue’s Marjolein van der Klauw, especially in the final That Was All She Wrote cannot remain unmentioned. The most beautiful song is the subdued Sweet Little Girl Blue that Eric plays on his mandolin only. Neerlandicana at its’ best. “He’s been playing guitar in BJ’s Pawnshop the last couple of years where he also sings all harmony vocals. For he’s also a very good singer. And not only that, he knows the art of writing very catchy songs. 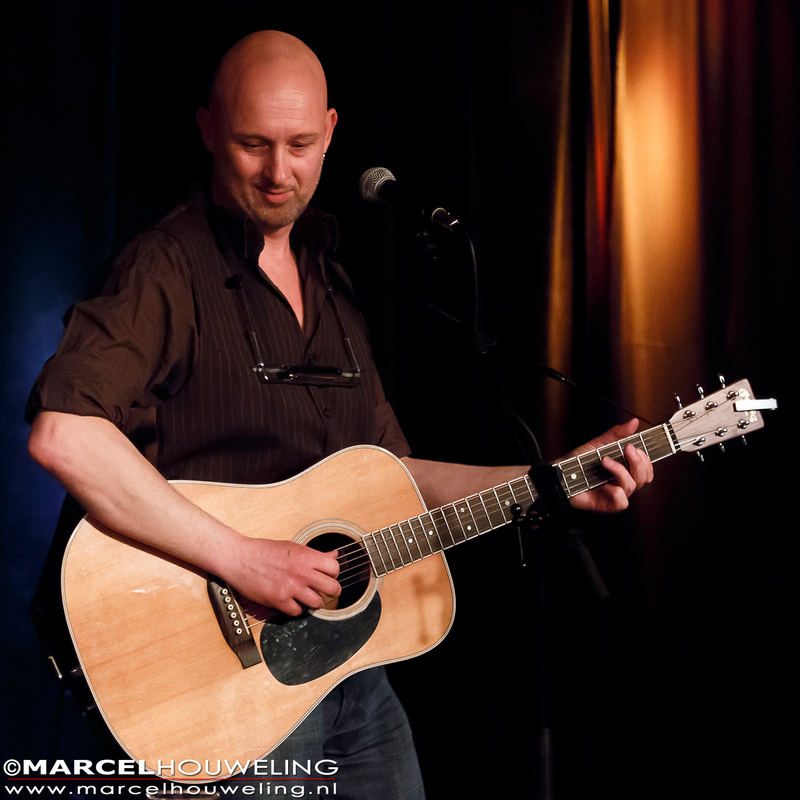 Together with Stephan van der Meijden the bald-headed musician recorded 15 songs with a natural diversity and ease. One minute he sounds like a contemporary mixture of Elvis Presley and Roy Orbison in the ballad “Remains of the day”, next thing you know you’re reliving the days of Gram Parsons and Emmylou Harris in the beautiful duet “That was all she wrote”. He’s rocking through “Start anew”and “Driving down the blacktop”. I can’t get enough of this album, not even after playing it for the 20th time.” To all A&R managers out there, this guy deserves to be signed. You all know the story of Sam Philips, I assume. “And then we’re talking about the exceptionally beautiful twosome ‘Walk back in the rain’ and ‘That was all she wrote’ sung with Marjolein van der Klauw. It’s here you find what an exceptionally good songwriter Devries really is. Seemingly without effort Devries comes up with acoustic material familiar to that of Steve Earle like ‘Sweet little girl blue’, good old countryrock like ‘Me and my love’, bluesy in ‘Some Unlucky Star’ and even pure country. ‘Remains of the day’ is a song like a dream, closely resembling the more recent work of the great Johnny Cash. A finer compliment one cannot make, I feel. Anyway, the conclusion is obvious: Devries’ debut album ‘Little of a Romeo’ is more than compatible with many a foreign product. And it’s ok to be just a little bit chauvinistic about it!